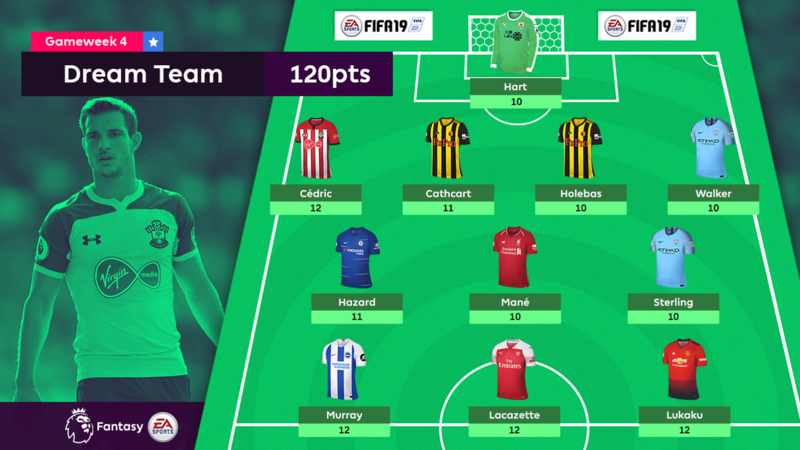 Just four players with double-digit ownership levels were among Gameweek 4's biggest scorers in Fantasy Premier League. Manchester United striker Romelu Lukaku (£11.0m), who hit both goals in the 2-0 win at Burnley, was much more representative of the Dream Team's make-up. His 12-point haul, which took him up to fourth place among FPL forwards, helped only 7.1 per cent of managers. The Belgian takes his place in a side using a 4-3-3 formation in which all four defenders produced attacking returns. The Burnley goalkeeper claimed seven saves against Man Utd. But it was his penalty stop to deny Paul Pogba (£8.2m) that elevated him, bringing in five points and earning Hart another two in bonus. Having managed just two points across the first three Gameweeks, the Southampton defender recorded 12 in the 2-0 win at Crystal Palace. Cedric provided an assist, kept a clean sheet and earned maximum bonus points for his 5.6 per cent ownership. The lowest-owned player in this week's Dream Team, Cathcart headed Watford's winner in the 2-1 victory over Tottenham Hotspur. That produced the maximum bonus. On Sunday the centre-back was owned by 0.3 per cent, but his first extra points of the season have prompted a slight increase in popularity. Cathcart's team-mate continued his excellent start to the campaign with his second double-digit tally. Holebas provided both assists at Vicarage Road. He has four for the season, equalling last year's total from just four matches, and his price has since risen by £0.1m. Some 10.3 per cent of managers enjoyed a rare Walker strike. His stunning winner in Manchester City's 2-1 defeat of Newcastle United was the full-back's first league goal in three years, and only his sixth in 10 top-flight seasons. The Chelsea midfielder has produced attacking returns in all four matches this season, with his goal in the 2-0 win over AFC Bournemouth helping him to his first double-digit haul of the campaign. Hazard is owned by 18.3 per cent and, after becoming the sixth-most popular transfer in for Gameweek 5, has enjoyed a 0.1 per cent price rise. His consistency was to the fore again as Liverpool saw off Leicester City 2-1. Mane’s third double-digit score in four Gameweeks came courtesy of the opening goal at King Power Stadium. That was his fourth strike in as many matches. The final midfield spot goes to the Man City winger, who scored his second goal of the season in the win over Newcastle. Sterling also earned maximum bonus points on the day, but remains in just 2.7 per cent of squads. The veteran striker scored both goals in Brighton & Hove Albion's 2-2 draw at home with Fulham. His second came from a penalty after the Seagulls' regular taker, Pascal Gross (£6.9m), had missed from the spot. Murray has three goals in his two home matches. The Arsenal forward's first start of the season was an all-action affair involving a goal, an assist and maximum bonus points. Only Murray and Christian Benteke (£6.5m), with six apiece, bettered his five goal attempts. Lukaku matched Lacazette for shots on goal and was the Gameweek leader in the Bonus Points System, with 50 BPS. The Man Utd forward has three goals from as many starts this season.